Back when we lived in Illinois there was no hiding my love of Wal-Mart and when they opened a new Supercenter in Woodstock I’d find reasons to stop by to “pick up a few things” multiple times a week. When we moved to Memphis I just assumed all Wal-Mart’s were created equal. But like the old saying goes, “You don’t know what you’ve got til it’s gone,” and, unfortunately, that’s the case now. 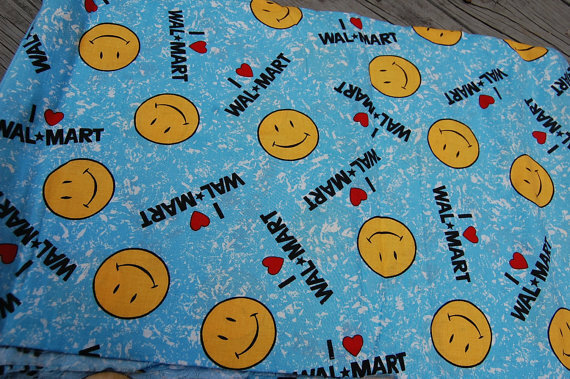 Tammy wouldn’t let me make these into sheets for our bed. Initially I was excited to see a Supercenter was on my way to work and couldn’t wait to swing by to check it out. I contained myself and waited for Tammy to go with me because I knew we needed to do some REAL grocery shopping. Looking back I can see that the signs were all there during our first visit, but I just chalked it up it to being a Saturday and us buying a lot of food. The shelves weren’t stocked properly and there seemed to only be five lines open, each with a minimum of 8-10 people waiting to check out. I didn’t think much about it until I went back a month or so later in my quest to taste all of the new Lay’s potato chip flavors. I don’t remember what night it was, only that it was around 6 p.m. on a weekday. Once again the shelves weren’t stocked properly and the lines were so long that they nearly reached the clothing sections. I never saw lines like that in Woodstock because they were always so quick to open new registers to keep the flow moving. I texted Tammy to complain about the lines and it was 22 minutes later before I was walking out of the store. I should have just put the chips down and walked out and I would have if I hadn’t wanted those chips so damn bad. I waited 22 minutes just to get 2 bags of these. So again, I wrote it off thinking my anger was misplaced. It was Lay’s fault for not making those chips more easily accessible. After all, I had lost count of how many stores we had been to in order to try to find those chips. Those two trips left such a bad taste in my mouth that I did most of our grocery shopping at Kroger or Costco instead of going back to Wal-Mart. I think I had been inside that Wal-Mart a total of FOUR times in NINE months, a far cry from when I was going so much that Tammy thought I was having an affair with someone at Wal-Mart. Recently I braved Wal-Mart once again because I needed some deodorant and turkey sausage (don’t judge). I figured it’d be cheaper to get it there than at Kroger or Walgreens. While Target would have had the deodorant they didn’t carry the sausage I was needing. Once again I found myself noticing the same things, shelves not stocked and incredibly long lines. I’ve pretty much decided that it’s worth the extra 50-75 cents to get my deodorant somewhere else, either that or I’ll start wearing the kinds that Costco offers. There’s a lot of things that I do NOT miss about the Chicagoland, the cold and snow being at the top. But on my list of things I DO miss, my Supercenter would definitely be in the Top 10 5 3. Gallery | This entry was posted in Daily Life and tagged daily-life, humor, life, people, Postaweek2014, shopping, wal-mart. Bookmark the permalink. The Costcos in California have to be the WORST ONES ever created. They are dirty, the staff are rude, they’re always out of stuff, and there are at least 3,000 booger-faced kids running in front of your cart at the same time. The ones here in Oregon here are okay, but they have so few. Oregon hates big corporations. Er, I meant Wal-Mart. Your mention of Costco (and my love of it) threw me off. Carry on. HAHAHAHA… We had never been to a Costco, but there is literally within walking distance of our place so we gave it a shot. It definitely gets crazy in there at times, but it’s SO much nicer than the Wal-Mart in our area. I’d just end up having to get 4-6 deodorants instead of 1… AND they don’t carry the Old Spice!! WTH!?!? I noticed just the opposite when I came to Dallas. The Wall-Marts here are amazing! (And yes, that’s for multiple places) I also like Kroger, Target and Aldi. I didn’t have any of those fancy stores back home. That’s how it was for me. All of the Wal-Mart’s in Mississippi were awesome but they sucked in Illinois. Then they built the Supercenter in Woodstock and it was AWESOME. I just assumed the one near us would be the same, but boy was I wrong. It’s horrible. Some of our friends drive an additional 10-15 minutes to go to another one instead of the on closest. There is a super-nice Aldi near that we need to start going to. They’ve always got some pretty decent fruit. I hate long lines! There’s not many things I truly hate. That’s a waste of time, right? And then to not stock the shelves on top of that?! That’s a loser store for sure. There is one place I go where I stand in lines, but it’s the cheapest place and I do a big shopping a lot times. Hope you find a replacement store.